Earlier this month, the experts at Pantone Color Institute named Living Coral as the Pantone Color of the Year for 2019. "Vibrant, yet mellow PANTONE 16-1546 Living Coral embraces us with warmth and nourishment to provide comfort and buoyancy in our continually shifting environment. In reaction to the onslaught of digital technology and social media increasingly embedding into daily life, we are seeking authentic and immersive experiences that enable connection and intimacy. Sociable and spirited, the engaging nature of PANTONE 16-1546 Living Coral welcomes and encourages lighthearted activity. Symbolizing our innate need for optimism and joyful pursuits, PANTONE 16-1546 Living Coral embodies our desire for playful expression. Representing the fusion of modern life, PANTONE Living Coral is a nurturing color that appears in our natural surroundings and at the same time, displays a lively presence within social media.."
While Pantone Colors of the Year have little effect on corporate marketing and branding, Living Coral will serve as inspiration for many in the design in fashion industries. Because Pantone Colors of the Year frequently take years to have broad appeal, promotional items may not be available in the exact Pantone color but there are many close alternatives from which to choose. 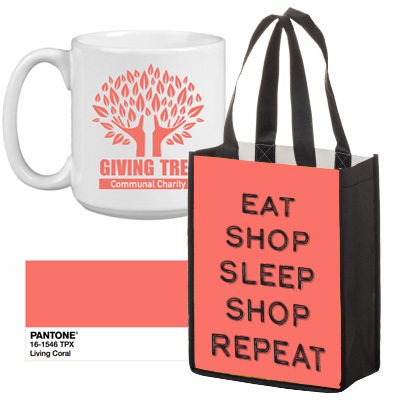 However, you can still be a fashion-forward, trend setter at your next event or fundraiser by choosing promotional products in energizing Living Coral and imprinting/embroidering with the Pantone Institute’s recommended color pairings. Many full color, dye sublimated promotional products can be designed using the Pantone Matching System (PMS) to include Living Coral for your next campaign. Select from ceramic mugs, stainless steel water bottles, lip balms, microfiber cloths and many other eco-friendly promotional items. Full color dye sublimated personalized pillows in Living Coral can make a trendy statement on a neutral colored couch or chair in a spa, design store or fashion boutique. Another way to use these colors for promotional branding is by selecting a natural colored item to start and incorporating Living Coral into the art design. Living Coral could be printed on natural colored cotton canvas bags for an elegant favor at fundraisers, fashion shows, galas and more.